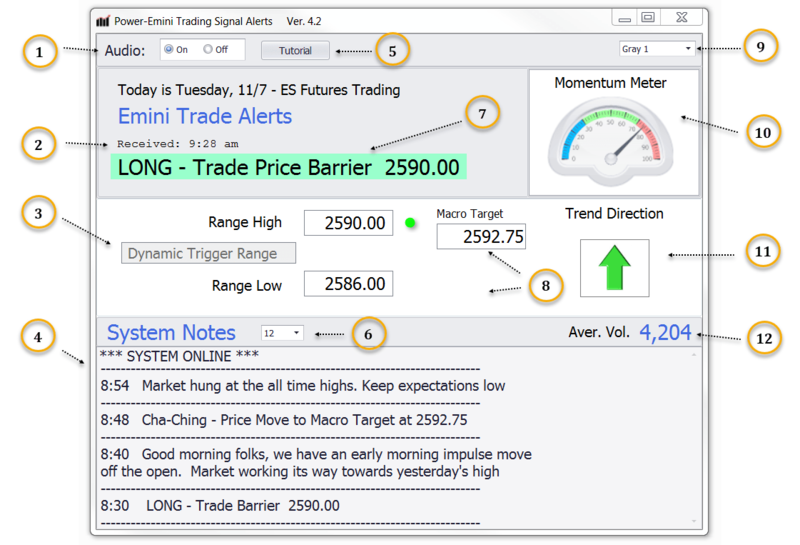 The Power E-Mini Alert Software is a stand-alone Windows application that delivers precision Day Trading signals to Futures traders. It’s 100% fully-automated and is the Best Day Trading Software you will find anywhere. Here is a screenshot with the main features noted. – (Click the image for full size). 1) Audio Alerts give you a heads-up when a trade is pending – when a Trade Alert Signal is given – when a Trailing Stop gets moved up – and when new System Notes are posted. 2) The Time Stamp lets you know exactly when a Signal was given. 3) The Dynamic Trigger Range is the Key to the system. It auto-adjust throughout the trading session and provides key levels to watch – they are your visual reference points on the chart. 4) The System Notes keep you on top of what is going on during the day – It’s like having a professional trading coach sitting by your side. 5) The Online Tutorial is your comprehensive Strategy Guide – with all the information you need to trade profitably using the Alerts. 6) You can adjust the font size in the System Notes to suit your preference. 7) This is the Alert Window – When a Signal fires it displays the Trade Price Barrier. 8) Once a trade is open – This section displays both the Macro Target and the current level to have a Trailing Stop. 9) Choose the software color scheme that you like. 10) The Momentum Meter uses a sophisticated set of indicators behind the scenes – to provide a real-time glimpse at “participant commitment”. 11) The Trend Direction indicator gives an intra-day look at the near-term prevailing trend. 12) The Average Volume indicator lets you know how active the participation is – It’s a 3-minute average of the number of contracts traded. In addition to our Day Trading Software for the Futures Market, as a member of Power Emini Trading you will receive extensive training on how to “trade with the signals” in real-life. You’ll get comprehensive online documentation as well as “Live Group Training Meetings” three Fridays a month. You will learn more about Day Trading Futures in our Group Training Sessions than if you spent thousands of dollars on those expensive courses everyone sells online.